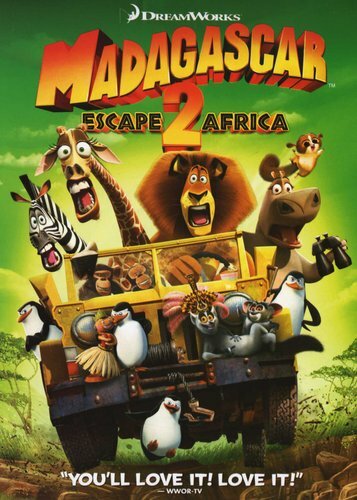 The penguins' hijacking of the Dreamworks trade-mark right at the onset establishes the mood for this zany, fast-paced sequel to the original Madagascar. Don't try to rationalize the story in too much detail. Just accept that it was aimed at an audience of children. As before, the voices include those of Ben Stillar, Chris Rock and Andy Richter, while Alec Baldwin vocalises for Makunga – a bad lion, not dissimilar to Scar (Jeremy Irons) in Disney's The Lion King of a few years back. The visuals are so beautiful that very often you forget that you're watching an animated feature, and the funnies keep coming at a fast and furious rate. Left marooned on the distant shores of Madagascar, the New Yorkers have hatched a plan so crazy it might just work. With military precision, the penguins have repaired an old crashed plane - sort of. Once aloft, this unlikely crew stays airborne just long enough to make it to the wildest place of all - the vast plains of Africa itself - where our zoo-raised crew encounter species of their own kind for the very first time. While discovering their roots, they quickly realize the differences between concrete jungle and the heart of Africa. Despite long-lost relatives, romantic rivals, and scheming hunters, Africa seems like a "crack-a-lackin" great place... but is it better than their Central Park home?